Place the rice in the bowl, cover with cold water and leave to soak for 2-3 hours. Using a sieve, strain the soaked rice, then place it in a steamer or the top half of double-boiler. Cover and steam over a high heat for 25-30 minutes, until soft and translucent. Pour 250ml (8 1/2 fl oz) of the coconut milk into a small mixing bowl. Add the sugar and salt, stirring until they dissolve. Add the cooked sticky rice and stir well until well mixed. Cover and leave to stand for 15 minutes. Meanwhile, peel and slice the mangoes and set aside. Place the remaining coconut milk in a small saucepan, bring to the boil, then take off the heat. 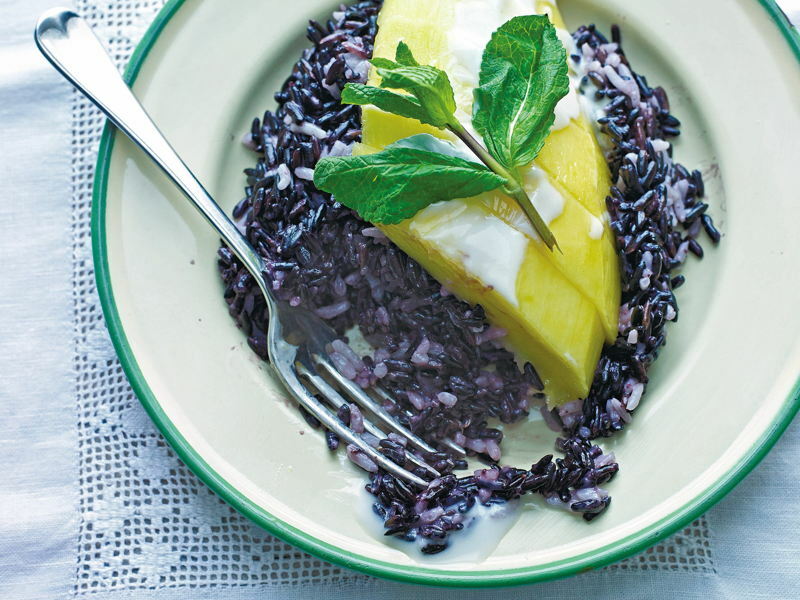 Divide the rice between 2 serving plates and top with the mango slice. Spoon over 3 tablespoons of the hot coconut milk and finish off with sprig of basil.